Dr Kwadwo Afari-Gyan, Chairman of the Electoral Commission has said provisional figures of voters registered during the recent voter replacement exercise indicated that there were 10,766,531 million people registered in the country. The old register contained 11,064,872 voters, he said. Dr Afari-Gyan was speaking at the opening of a two-day Voters Registration Review meeting the EC in collaboration with the USAID and KAB Consult, organised for its Commissioners, Directors and Regional Directors as well as political party representatives at Koforidua on Wednesday. He described the two-week registration exercise as "technically the best registration exercise ever undertaken by the EC," but conceded, however, that "there were some localised problems which the EC anticipated" adding, "what is important is that the EC was able to deal with them, especially in Greater Accra." Dr Afari-Gyan who recalled criticisms of the exercise, noted that "some of them were blown out of proportion by mainly political parties which are not on the ground." 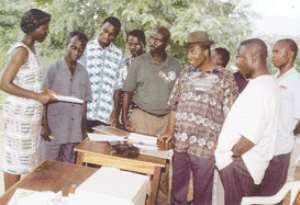 The Chairman explained that the current voters' register was been regarded as "provisional" because of the challenges filed against some people and the absence of figures on qualified Ghanaians abroad such as the country's foreign missions staff, students on government scholarship and security officials on peacekeeping duties, adding that the total figure could be about 11 million voters. Dr Afari-Gyan who confirmed that the previous voters register was "really bloated", explained that the results from this year's exercise showed that of all the ten regions, it was only the Greater Accra which recorded figures above the old one. He said the present register indicated that 2.1 million voters registered as against 1.9 million in the old one, and cited Weija and Amasaman areas as the principal places with the increased figures. The Principal of the Koforidua Polytechnic, Dr Henry Appiah who was the guest speaker, emphasised that to ensure fairness and a level playing field in the December elections, "the voters register is the one of such playing fields." He noted that since it was accepted that the register used for the 2000 elections was bloated, and "did not reflect the true numbers with which we can accept the results of elections, then it is the responsibility of all of us to replace it." Dr Appiah reminded political parties that if the independence of the EC was accepted by them, then they should address any grievances on the registration to it, pointing out that "we need not draw what is purely administrative affair of the EC into anybody's to create unnecessary tension that can lead to undesired consequences." He urged Ghanaians to avoid reading politics into the exercise and asked the parties to in future, to embrace the exercise with enthusiasm. Ms Tracey Hebert of the USAID who described the review meeting as "worthwhile", said that was important for her Mission to commit, up to five million US dollars to fund EC's activities to increase the citizens' confidence in the electoral system. She said her Mission was committed to assisting Ghana on its path of democratic consolidation and recognised the importance of this year's election, saying for this reason, the US Mission in Ghana had gone to Washington DC to stress the importance of supporting the elections and hoping for positive response. The Methodist Bishop of Koforidua, Rt. Rev. Emmanuel Twum Baah, who chaired the function, stressed that Ghanaians wanted a reliable voters register and an electoral system and urged the EC to answer to the concerns of the electorate during any electoral exercise.